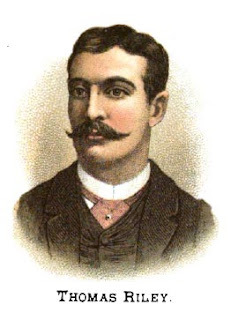 Murder by Gaslight: Thomas Riley. "At an early hour on Sunday, Dec. 12, 1886, Robert Coleman was murdered by Thomas Riley, at Greensburg, Pa. Riley worked in the Crab Tree Mines where Coleman had been previously employed as a Deputy Sheriff, and against whom Riley had taken a great dislike. On their exit from a restaurant, where they had been together, apparently as friends, Riley struck Coleman on the head with some blunt instrument, killing him instantly. He was immediately arrested."